Thanks to our amazing developer community, Digital Ocean, GitHub and Twilio, we are in the midst of another extraordinary Hacktoberfest! We hope you will join us in the fun (there are available issues for all levels of skill, with new issues added daily), we have some art museum quality swag once again for you, thanks to our all-star graphic designer Virginia Van Keuren. So far we have received 524 PRs with 540 story points donated from Hacktoberfest participants from all around the world. In this post, we’ll highlight some of the outstanding contributions so far and offer some ideas on how you can continue to level up your skills while donating code that affects thousands of developers sending billions of emails. Let’s not forget the bragging rights of earning a spot on the leaderboard. To those who are maintaining repos and participating in Hacktoberfest, welcome to the Hackening. 🙂 If you are not, you really should! We had a 3,510% increase in PRs last year; learn some quick tips from our story in this Hacktoberfest case study. We hope it’s useful for you. We would love to earn your ears with a subscription to our podcast about open source, Some Coding Required (iTunes, SoundCloud). The latest episode taps into our learnings from last years Hacktoberfest. Enjoy! We also recommend you check out the ChangeLog’s Hacktoberfest podcast episode where they speak to one of the Hacktoberfest creators, Daniel Zaltsman of Digital Ocean. It is important to stay in sync with end of life calendars so that we don’t encourage developers to use versions that are no longer supported. In this case, a talented developer went ahead and made these updates for us without even asking 🙂 This is a great example of a Hacktoberfest contribution that goes beyond what we have listed and labeled in our issues. Be inspired to bring your own enhancements to the table, we love it! 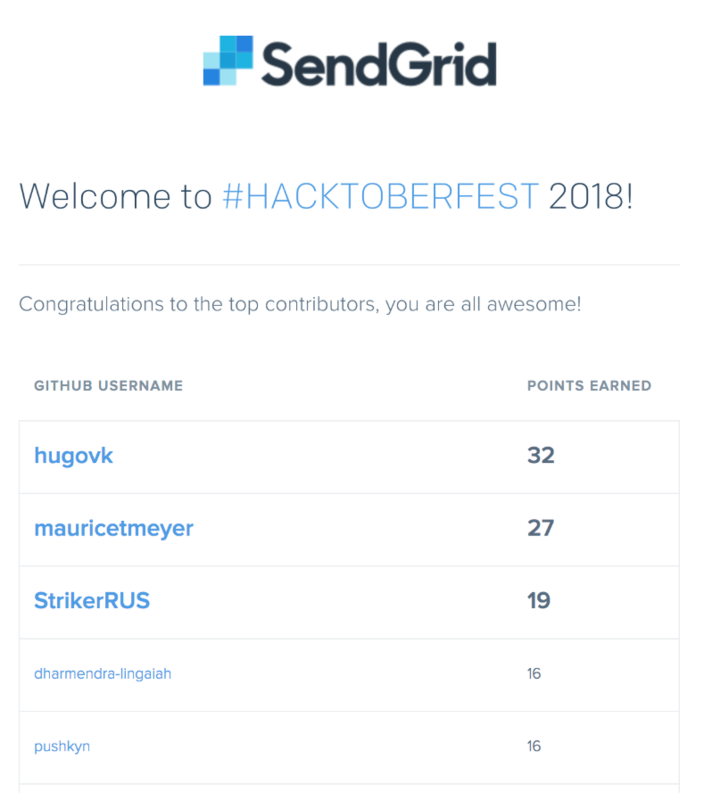 Shout out to Hugo for this PR, he also is the current SendGrid Hacktoberfest leader! To maintain consistency and quality, automation is a key part of our processes. One area we have been wanting to automate for some time is the deploy process to the respective package managers for our SDKs. This PR does this for our popular C# Nuget package which has over 4 million downloads! Shout out to Xavier Hahn for this PR! We have had multiple requests for documentation of this feature and so far we only had it for Python, that is, until now! Now you can easily get up and running processing inbound parse webhook data. For example, you can set up a parse enabled email and direct all of your social media notifications to it. Then, your webhook can process those notifications and convert that data into a useful dashboard. 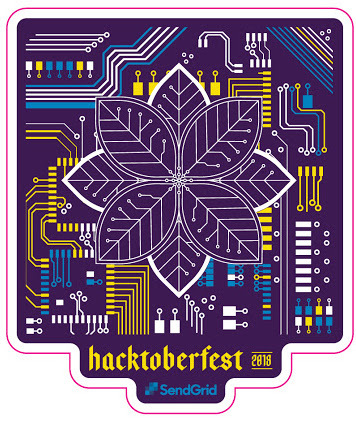 Check out our Hacktoberfest Ideas repo if you would like to help create that demo app. Shout out to Ashley Roach for this PR! We started an Hacktoberfest ideas repository for those who were looking for a bigger challenge. So far, the suggested ideas have been super solid, please keep them coming!